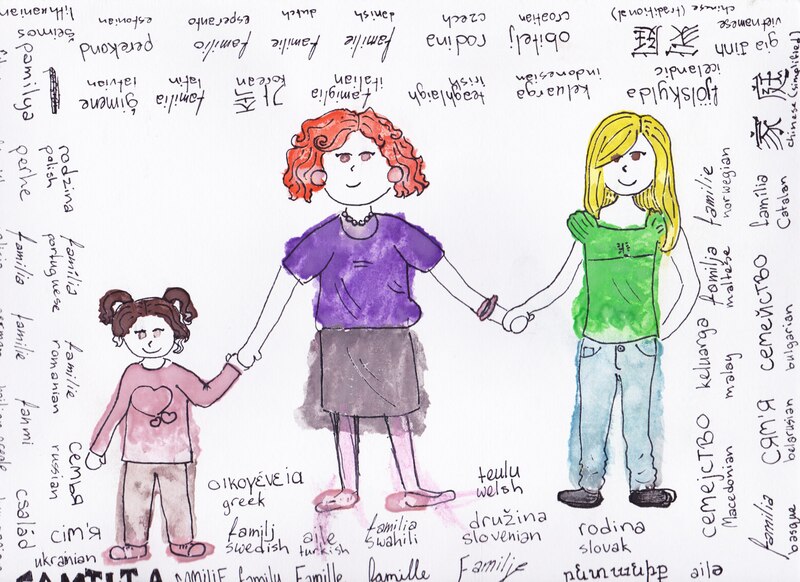 Art done by my very creative oldest daughter, she wrote the word family in 50 languages around the edges! I grew up in what has always been “My Grandmother’s house”. I was not raised by my Grandmother but my family and I moved into that house when I was 5 years old. It was a little white country house with green gables, the smell of dill weed and giant pink peonies danced along with an old green squeaky rocker swing sitting in the garden. To this day I still hear the screen door slamming shut behind us as we ran in and out of the house. The day we moved in I remember walking from the trailer to the house, trying to follow in my father’s footsteps. I had to jump because I wanted to match his stride. I can still see the muddy footprints in my mind, his work boots looked so heavy. Big footsteps to follow for a five-year-old little girl! Many aunts and uncles grew up in that house (including my Dad of course), most were born there. There was the girl’s room and there was the boy’s room. I loved my aunts and I loved “sharing” a room with them, energetically speaking, and that made me feel very special. They shared that room growing up and I imagined they shared a few stories between those four walls. I had the room all to myself, and since there was no one else to talk to, I had talks with the energy in the room and let the walls tell me what they needed me to hear. Only later, as a grown woman with challenging life experiences under my belt, two daughters to raise on my own and some serious questions that needed to be answered, did I start wondering if the murmurs coming from the kitchen down below growing up shared a similar story to those heard by the women who were there before me. It was an honour for me to sleep in the “girls’ room”… but what did that really mean? We all know what it’s like from the outside looking in, but what is it like from the inside looking out? I can only speak for myself but digging through the generational imprints and family of origin was part of what I needed to do to fully understand who I now am and why I made the choices I made. What was in my immediate circle of influence? What came from generations before me and what part did it play in my story, in my daughter’s story? I had to know what I was REALLY made of. The free spirit in me made my thoughts travel far and wide, and the voice of my intuition connected me to some pretty amazing aspects of the world unseen from a very young age. I took flight in my mind and my body soon followed, and the creative journey started to unfold … perfectly! Now my creative gifts have more meaning then they even have. What voices encourage you to pursue your dreams? What holds you back? What are you really made of? Share a comment, I’d love to know!